They Did Surgery on a Grape. That Is All. If you've entered the black hole we call "the internet" recently, you already know: They did surgery on a grape. This statement, however poetic, may leave you with a number of questions. For starters, who is 'they'? What kind of surgery? How is the grape recovering? Was it seedless? And why does everyone care? Everyday internet trolls, on the other hand, are not interested in answering your questions. In fact, just the opposite. The web seems far more keen on responding to all of your inquiries with a simple "they did surgery on a grape". You want some background information? They did surgery on a grape. You want a little clarification? They did surgery on a grape. You're hungry? They did surgery on a grape. Understood? What actually is the "surgery on a grape" meme? As with all great copy in contemporary America, the wise, enigmatic phrase is meme-related. The actual sentence comes from a 2017 video posted by social media news outlet, Cheddar. 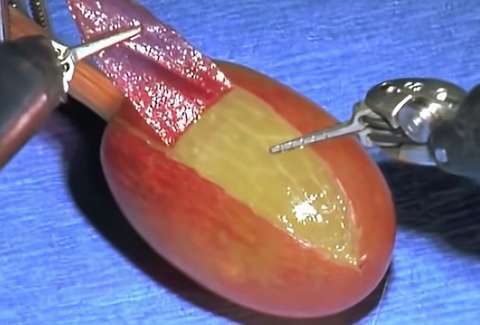 Using footage from a Chicago medical facility, the video shows a team of surgeons demonstrating their new medical robot's miraculous precision by using it to gingerly remove the skin from a grape. Producer Max Godnick, who wrote the holy words, "they did surgery on a grape," surely intended for his proclamation to be taken at face value. It was merely a subtitle. In the grand realm of memes, however, nothing is sacred. Immediately after the video's release, Instagram meme-producer @simpledorito posted a screenshot of the text on screen. No editing or additional commentary was necessary -- the meme simply birthed itself. Removed from context, "they did surgery on a grape" is inexplicably funny. It may also be a brilliant, fraught metaphor for the state of the union, and our fate as cogs in this great capitalist machine. Man: *runs in screaming after being shot twice* CAN I GET A DOCTOR?! So why, a full year later, are we still reveling in the poetics of the glorious grape-line? Like with "mom jeans" and ugly, pseudo-corrective white sneakers, things come full circle. Once re-introduced, the phrase quickly went viral for the second time. Folks couldn't help but circulate it. It's the swine flu of subtitles. Not only does, "they did surgery on a grape" poke fun at the sort of tacky quick-turn video production that consumed the internet circa early 2017, but the use of the passive voice seems to have become an important part of the millennial web lexicon. This meme would certainly not exist if Godnick had written, "Doctors operate on a fruit," for the same reasons "doing a Tweet" is far funnier than "tweeting." But why did they do surgery on a grape? At bottom, the grape surgery was simply an expression of technological prowess. It was merely a demonstration. To your questions: The ominous "they" is a team of Chicago doctors. The surgery in question was skin-removal. The grape was red, but we have no information about its current whereabouts. You should understand by this point, however, that none of this information is relevant. "They did surgery on a grape" is about more than a small ovular fruit. It's about post-modern digital media, it's about where our great nation is applying its funds and its energy, and it's probably also about the ways your relationship with your mother is infiltrating your love life. Sit with it. Take it in. They did surgery on a grape.